Okay, that blog title might be a bit dramatic. Still, I feel I have been denied vital information. To wit, there is a Friendship is Magic: the Gathering panel at BABSCon. It's literally called Friendship is Magic: the Gathering. I’m not going to say anything above the fold. This one’s pretty much a spoiler minefield. This isn't just a follower milestone blog (though while I'm here, thanks to all 1,501 of you,) it's also an announcement. My flight's been booked, my hotel's reserved. I'm going to Everfree Northwest this year. Looking forward to seeing any and all of you who will also be attending. Yeesh. They aren’t pulling any punches, are they? This is indeed the final premiere of Friendship is Magic. Let’s see how we start the endgame. 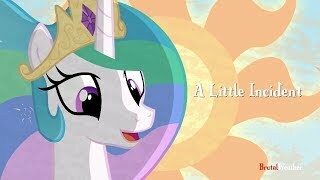 Happy Celestia Day. And if you're not watching BrutalWeather, you should be. Celestia: ...there was a spider. How cute! Also: If a spell or ability would destroy Tiny Glowspider, that spell's or ability's controller sacrifices a land instead. Celestia making horse noises is both jarring and adorable. Follow them, saw the video yesterday, still absolutely adore it. CHS (the one with the many old equines, not the one with the many young simians) has also discovered that while Princess Luna has retained a well-known habit of slipping into a rather archaic dialect from a thousand years ago, Princess Celestia tends to use an even more ancient accent of Equish when sufficiently surprised or otherwise agitated (see audio samples). This information has been redacted from the official report, however, because of a note from Princess Celestia stating that us revealing said information to the broad public "might 'agitate' [her], particularly in the general direction of the CHS' campus" (again, the equine one, not the simian one). We do not know which large, dark and shadowy intruder has broken into our offices to steal this report, then use the printing press in the basement for several hours to make leaflets out of select parts while cackling madly. We are also not officially aware of any connections between said incident and any donations made to the CHS, nor the newly formed 'Royal Collateral Fund' (in case our facilities are 'agitated'). I like the detail of Luna buried in the other room. It was probably Luna's pet, too. Nothing kills the mood at a wedding like the pastor demolishing the chapel with fusion lasers. In addition to Celestia's archaic predilections as noted by River Road, the CHS (hoers, not munky) footage did not receive the same thorough localization process as Crown-approved, TV-Y adaptations of the life and times of the Bearers of Harmony and those close to them. Between that and the haste with which the Historical Society disseminated the footage, there was simply no time for translation, and thus it is presented neither subbed nor dubbed, but only in raw Equish. Up to and including destroying the house? So basically if we were to watch the show undubbed all we'd hear would be a lot of whinnying. One time, she found a big brown spider on the wall of her room: she asked me to get the broom and, once I gave it to her, proceeded to smash it against the wall multiple times chasing after it. In the end, she killed the spider and a small chunk of the wall by the windowsill had come off. Mom and Dad were out with friends at the time, so they didn't hear the racket and it gave us time to hide the damage (after disposing of the smooshed spider carcass) by moving her bookshelf in front of the spot. Looking back on the whole thing, it was like something straight out of a sitcom. What does that say about our life? And that's how we moved the capital in a fit of NOPENOPENOPE!